After seven decades of research and experience and effort, I’d say we have only partial answers to these questions because the decisive factor—public policy—is fundamentally indeterminate. The political choices being made in PNG bring this into relief. The current government’s policies can be characterized as blatantly disregarding norms of good governance or as pragmatic initiatives to construct a national and civil polity. Which of these characterizations is more accurate will only be revealed by the social and environmental consequences. For starters, let me explain why Papua New Guinea (PNG) is the center of the world. One individual I met during my travels told me, “The world looks very different from here … You see a country in transition, strategically located as the bridge between Asia and the Pacific.” Then he convinced me with two maps on his wall much like the following. 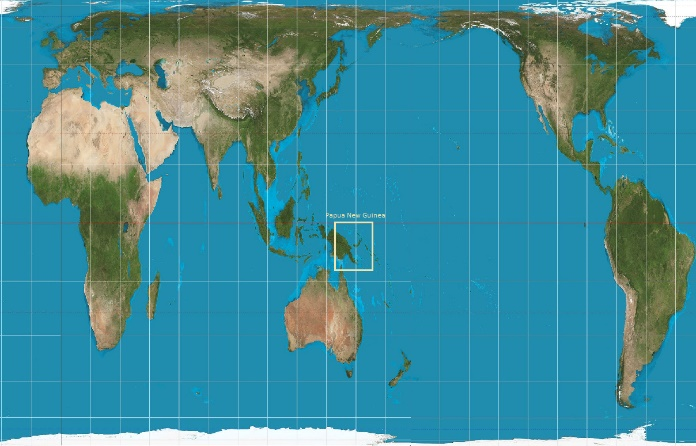 But the Mercator projection minimizes the size of countries near the equator. Arbitrarily centering the map on the Atlantic Ocean also puts Papua New Guinea on the far-right fringe. 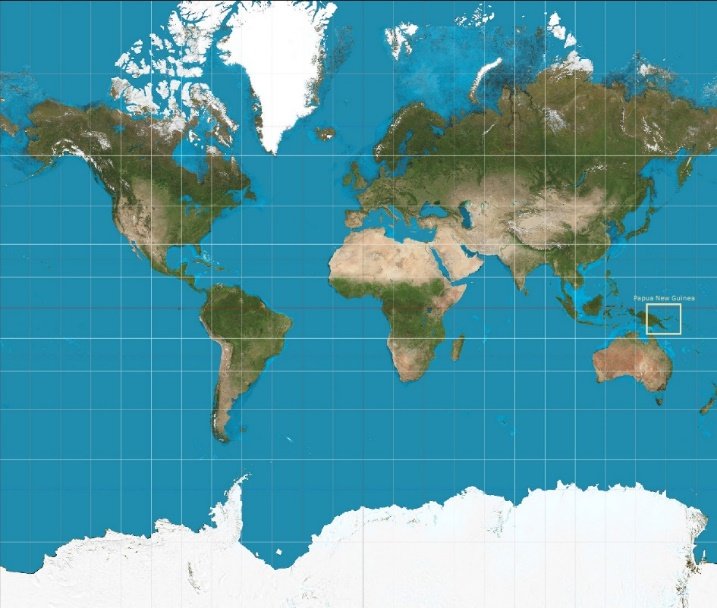 As you can see, Papua New Guinea is the center of the world. It is actually larger than Sweden, Iraq, or Germany. With a population of about 8 million, it is comparable to Israel, Switzerland, and Bulgaria, and it will grow to 10 million by 2030. The re-centered map also shows that Papua New Guinea is firmly placed near Asia-Pacific trade routes, with valuable mineral and oil resources demanded by economic giants like China, Japan, Malaysia, the Philippines, and South Korea. PNG’s central location is partly driving a construction boom in Port Moresby as the country prepares to host the Asia-Pacific Economic Cooperation (APEC) meetings in 2018. In addition, PNG benefits from a long coastline (we know that being landlocked is a hindrance to development). It shares a land border with Indonesia, one of Asia’s largest economies and its 260 million people. It is also close to a place with higher wages (more on that below). PNG has also played a central role in one of the world’s most challenging crises: climate change. In 2005, along with Costa Rica, the PNG government led a coalition of rainforest nations to develop a system, known as REDD+, that would compensate them for preserving their rainforests. These proposals eventually led to billion-dollar programs like the Amazon Fund. If global targets of slowing climate change by 2030 are going to be met, it will require sharp reductions in tropical deforestation because deforestation releases large greenhouse gas emissions; because destroying mature forests reduces carbon sequestration; and because policies for preserving tropical forests are among the most cost-effective ways to address global warming (see CGD’s Why Forests? Why Now?). Nevertheless, PNG is a struggling developing country with common problems of small size, concentrated exports, high income inequality, and political fragmentation. Its population is dispersed—85 percent of people live in rural areas. Domestic integration is difficult because of mountainous terrain and a combination of geology and climate that makes road maintenance costly. PNG’s per capita income barely budged from 1960 to 2000 (rising from $1,200 to about $1,900 in 2011 USD), but it experienced a resource boom and grew 60 percent to $3,000 in 2017. It is projected to reach $3,900 sometime in 2030. PNG’s top exports come from mining (gold and copper) and agriculture (palm oil and coffee). A massive investment by ExxonMobil into extracting natural gas (LNG) contributed to the investment boom, but that project only started producing in 2014—just as global fuel prices began to decline. Economic growth is expected to resume at a modest pace on the base of extracting natural resources and agriculture, however, few expect the economic benefits from these sectors to be widely shared. Some argue that PNG will face a “natural resource curse,” including evidence that resource exports are driving up exchange rates and reducing the profitability of local industry. Others have documented the way promises of jobs and income for local communities can devolve into militarization and exacerbate inter-ethnic conflict. Current policies are keeping the currency overvalued and dependence on imported consumer goods may be one of the motivations that the country (elites?) won’t let the foreign exchange rate adjust more rapidly. One response to the resource curse would be to diversify exports, but the greatest potential probably lies in reaping the benefits of labor mobility. PNG is on one side of an economic cliff relative to Australia. The Torres Strait islands that are part of Australia lie only 4 km from PNG. I was told you can travel between PNG and Australia’s mainland “in a tinny in half a day.” While that proximity has implications for controlling illicit trade and the spread of infectious disease, it also presents an incredible opportunity for raising incomes in both countries by encouraging properly regulated temporary migration. Average wages in PNG are on the order of $580 USD per month (including the formal sector), while Australian wages are closer to $5,600 per month—a place premium of 10 to 1. No anti-poverty program exists to help Papuans raise their income on the scale that would be possible by an appropriate labor mobility agreement, temporary work program, or skills partnership. While PNG is more “central” than you might think, it is still a lower-middle income country with poor health conditions. Life expectancy is only about 60 years on average. Health has improved over the last two decades, but the pace has been too slow for PNG to meet any of the Millennium Development Goals. Infant mortality and maternal mortality remain high at about 47 per 1,000 live births and 215 per 100,000 births, respectively. Measles, diarrhea, and respiratory illnesses are among the top 10 risks for premature death, but increasingly Papuans are dying early from non-communicable diseases (NCDs – see figure below). The reasons for this slow pace of improvement are multifaceted and complex, but public health policy hasn’t been particularly helpful. Several Papuans told me they remembered community workers who maintained demographic and health records and conducted outreach visits when they were young, but reported that these functions are rarely performed today. A few years ago, a study described 2002 to 2012 as a “lost decade” because, by many measures, the provision of primary health care stagnated or declined during that period. That study documented declines in drug availability, consultations and availability of doctors at front-line facilities, and attributed these changes to poor management and less public funding reaching facilities. Indeed, public financial management and the politics that drive it are the factors that will make or break PNG’s future. PNG has been independent for only 40 years and has undertaken two major waves of decentralization as part of the process of building a national political order and a viable governing coalition. In his effort to push resources and benefits to local communities, Prime Minister O’Neill created a District Services Improvement Program (DSIP) which gives each parliamentarian the equivalent of US$3 million each year to spend in their district without restrictions. While its critics call the money “slush funds” and deride it as institutionalizing corruption, O’Neill and its defenders argue it is more effective than national policies and strategies for reaching the local level. Spending these funds seems to be hindered by the same difficulties in financial and human resource management that have characterized national and provincial service systems and political favoritism. Ironically, the devolution of spending could also serve to strengthen central authority by investing more power in national parliamentarians. The sophistication of a political system that mediates among more than 800 languages and cultures cannot be underestimated, yet it still seems to be focusing on short-term tactical gains at the expense of long-term goals. PNG is certainly not unique in this regard. It’s a trait shared by most countries. Nevertheless, PNG is facing a significant transition in the next decade as foreign investment and increased international engagement bring resource benefits along with resource curses. As I look at what we’ve learned in the field of development, I wonder, what advice we can offer the next government? The benefits of prudent fiscal and monetary policies, rule of law, tough negotiations for revenues from extractive industries, labor mobility agreements, and promoting intensification of agriculture rather than destroying forests sound good, but all rely on constructing a political coalition aimed to serve collective national prosperity and not necessarily particular interests. The benefits that come from investments in education, health, and infrastructure are similarly widespread without necessarily helping incumbents win re-election. Creating and implementing an effective national bureaucracy to serve the people is a daunting challenge. This country deserves the best that the international system can offer from researchers, policy practitioners, and funders to help meet these challenges and get the most out of its opportunities. The “how” embedded in politics is the one thing countries like PNG need to figure out for themselves. The rest of the world cannot answer that conundrum but we should help with the rest. Thanks to Emily Foecke for her inputs to this blog post, Sarah Allen for her help in putting it together, and to the Australian and PNG officials and individuals who took the time to speak with me during my trip. Updated 6/22/2017: Estimates of Australian and PNG wages have been corrected. The original post included incorrect estimates of wages and mistakenly reported a place premium of 38 to 1.